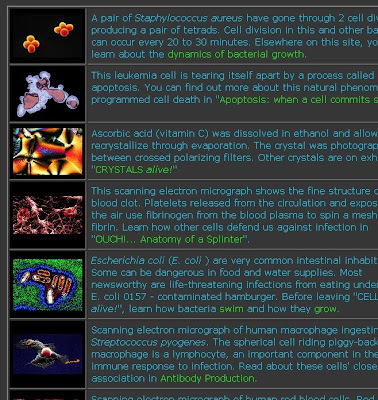 Cells Alive is a site that has a huge amount of information about cells. It has everything from pictures and descriptions of different types of cells, to interactive demos and images about cell anatomy, meiosis, mitosis, the cell cycle, and more. There is a section with homework help, interactive quizzes, science fair ideas, and a cell gallery with pictures and descriptions of cells ranging from human red blood cells to viruses and bacteria. 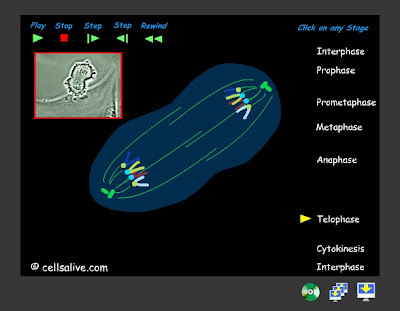 The Animal Cell Mitosis interactive demo has a computer graphic of mitosis along with a microscope video of an actual cell going through mitosis. This is a great site for biology classes.